“Nonno,” Italian for “Grandfather,” is attributed to Galveston Restaurant Group’s patriarch, Tony Smecca (Johnny and Joey Smecca’s father). “Paulie’s Bar,” another family namesake, is named in honor of Danny Hart’s father, the third partner of Galveston Restaurant Group. Nonno Tony’s world flavors will utilize techniques honed at other Galveston Restaurant Group properties. “We wanted to celebrate some of the most iconic dishes from all our restaurants,” adds Joey Smecca. Galveston Restaurant Group has brought the “art of good eating” to patrons since 1997. Created by Johnny Smecca, Joey Smecca and Danny Hart, when they opened their first restaurant, Saltwater Grill in 1998, located in the heart of the Galveston Arts & Entertainment District. Since then, they have been creating, prospering and selling restaurant concepts that deliver the best dining experiences on the Texas Gulf Coast. Galveston Restaurant Group owns and operates Mario’s Seawall Italian Restaurant, Papa’s Pizza, Saltwater Grill, Sky Bar & Sushi and Little Daddy’s Gumbo Bar. Visit them online at www.GalvestonRestaurantGroup.com. The Pier 21 Complex offers space for dining, retail and entertainment. 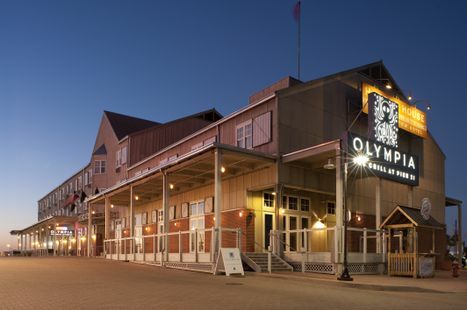 Current restaurant tenants include Olympia The Grill at Pier 21, Willie G's Seafood & Steak House, Nonno Tony's World Kitchen (coming summer 2012), and Fisherman's Wharf.